Students who recently received their permits were given a business card (seen at the left). Students are now required to schedule their driving tests online after selecting a specific DPS office location. The link on the DPS card points here where you can select your location. Students can schedule their DPS driving test with MDA. Benefits including scheduling an appointment convenient to you and driving in locations familiar to your child. 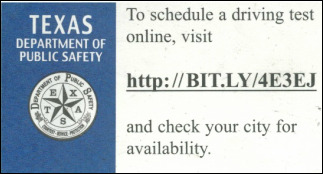 Click here to learn more about scheduling a DPS driving test with MDA. Plan ahead to schedule your test at a time that works for you. Their schedule (depending on the time of year and which office you select) can fill up to a month in advance. To test at the DPS you will need to take your drivers education certificate of completion (form DE-964E), your instruction permit, your social security card, your 30 hour driving log, proof of insurance, and $11. Please call your selected office BEFORE you go test to ensure they have not changed their requirements.